Turin is being gripped by Ronaldo mania. After nine years plying his trade at Real Madrid, the Portuguese superstar has made the switch to Juventus for $129.3 million. Even though he has enjoyed tremendous success over the years, eyebrows were raised at the transfer fee due to Ronaldo’s age of 33. Even he admitted that “players his age usually go to Qatar or China” and he thanked Juventus for giving him an opportunity. 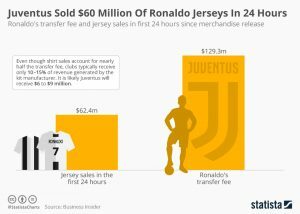 As one of the world’s most famous and successful athletes, Ronaldo’s appeal is still tremendously strong and Juventus have gained a significant financial boost after signing him. Shares in the Italian club shot up 40 percent after news of his signing broke while its social media channels acquired 1.5 million new followers in a single day. Ronaldo is starting to repay his transfer fee even though he hasn’t even kicked a soccer ball yet. In the first 24 hours after Juventus released his kit, 520,000 jerseys were sold, adding up to $62.4 million and nearly half the transfer fee according to Business Insider. As positive as that sounds for the Italian champions, merchandise sales are a little bit more complicated. Soccer clubs usually receive somewhere in the region of 10 to 15 percent of the revenue a kit manufacturer generates from merchandise sales, meaning Juventus will probably make (a still not too shabby) $9 million.